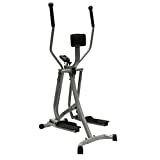 The Bentley Fitness Air Walker is the perfect tool exercise and keep fit indoors. This air walker is designed to keep the user in one place while moving and exercising their whole body. Using the foot plates the user can swing their legs forward and backwards to work up their heart rate and loose weight. Additionally this item has secure handles with foam grips and a middle padded rest for extra support and a electronic monitor which tracks the workout. Please note: Maximum user weight is 100kg.